The dollar’s worst start to a year since 1987 may get a lot worse. 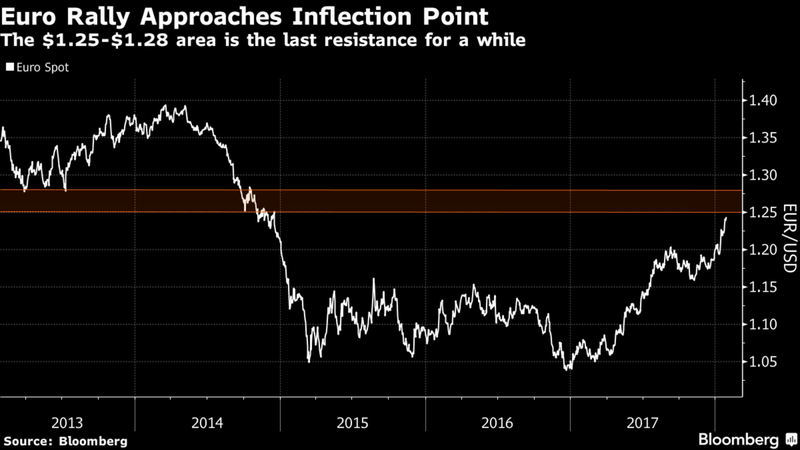 Regardless of whether the Trump administration wants a strong U.S. currency or not, this week’s plunge is breaching technical barriers that had stood as proverbial last lines of defense against a significant gap lower. 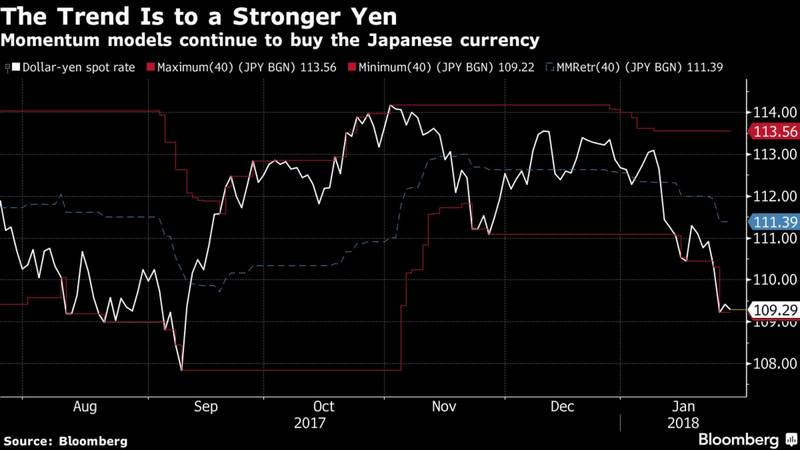 Amid a rout that stands at about 3.5 percent year-to-date, there’s no shortage of ammunition for traders looking to wager against the greenback. 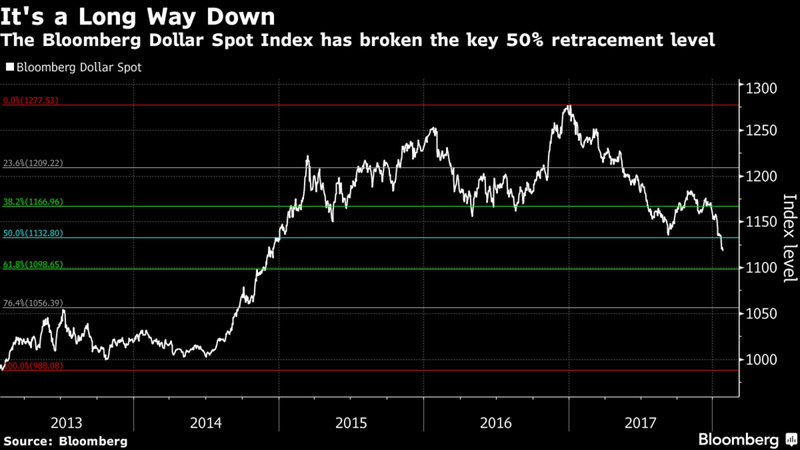 After the Bloomberg Dollar Spot Index closed Tuesday right on the 50 percent retracement line, Wednesday’s selloff saw it break right through. Given the sharp rally in 2014, there’s not a lot of support levels until it reverses. There will likely be a pause near 1100, but there isn’t much major long-term support until the 1056 level, around 5 percent lower. Trend-following models have been building long yen positions since the 111.06 level. With each new low, that position is being added to. With little resistance until the 108 handle, there’s room for the yen to keep strengthening. 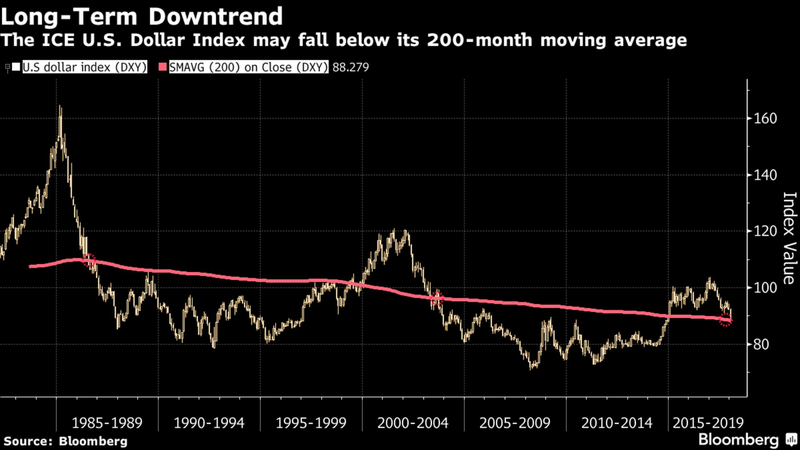 Intercontinental Exchange Inc.’s U.S. Dollar Index is poised to break below its 200-month moving average for the first time in a decade and a half. The last two times the index fell below this long-term measure of relative strength, in 1986 and 2003, it struggled to find its footing, falling over 25 percent to a cyclical low over the next half decade. 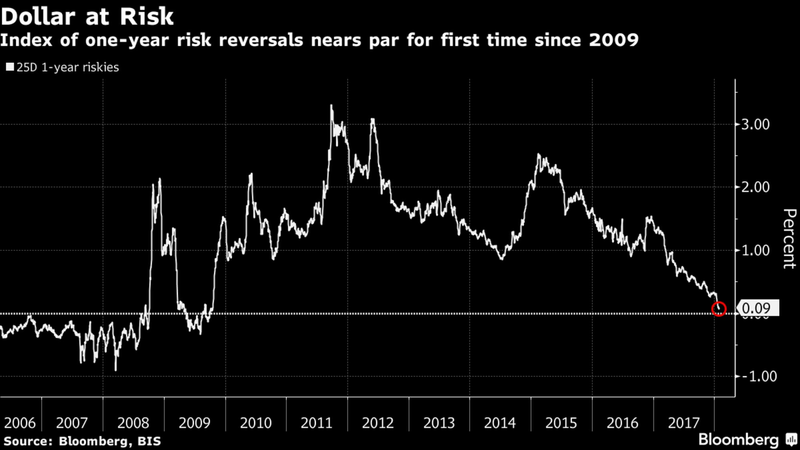 A turnover-weighted basket of one-year risk reversals — barometers of greenback market sentiment — has tumbled this year and is approaching par for the first time since 2009. The last time the skew was so pronounced, the dollar fell 10 percent over several months. One silver lining may come from signals in the relative strength index. 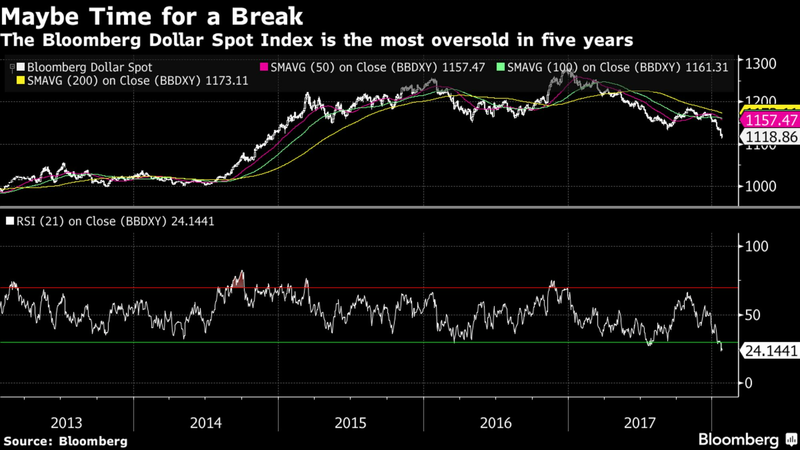 The recent plunge suggests the dollar is more oversold than at any time in the past five years, implying that some of the downward momentum might slow, at least for now. NOTE: Jacob Bourne and Robert Fullem are FX strategists who write for Bloomberg. The observations they makes are their own and are not intended as investment advice.